Tamar Heller, Sarah Parker Harris, Carol J. Gill, and Robert Gould. 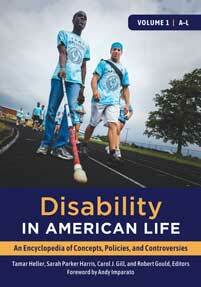 Disability in American Life: An Encyclopedia of Concepts, Policies, and Controversies [2 volumes]. ABC-CLIO, 2018. ABC-CLIO, publisher.abc-clio.com/9781440834233. Disability—as with other marginalized topics in social policy—is at risk for exclusion from social debate. This multivolume reference work provides an overview of challenges and opportunities for people with disabilities and their families at all stages of life.